As an equipment technician, I see my share of do it yourself fixes (or should I say temporary band-aids). Duct tape, electrical tape, and DIY wire splicing jobs are commonplace. The neglect and abuse on equipment that comes in for service used to surprise me. Not anymore. Nor does the quality of equipment that is brought in for repair. Why do some business owners, managers, and supervisors treat the tools that help make them money as an after-thought? 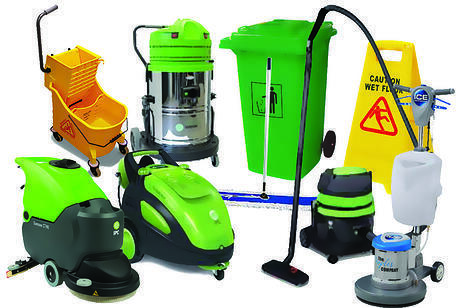 Here are 4 professional cleaning equipment tips that will save you a fortune. We all have financial considerations when making a purchase. Consider cleaning equipment an investment. Invest in the best tools for the job. First, focus on the floor or surface type, the soil type, and the soil load as different floors and surfaces have different cleaning requirements. For example, marble and granite require polishing to maintain the natural luster, while VCT (vinyl composite tile) requires periodic scrubbing and burnishing. Once you determine the size, surface, soil type, and soil load of the areas you need to clean, you can consider other decision-making factors like noise level, filtration, battery run time, soil recovery, etc. You may want to ask the opinion of someone you know and trust who does similar work and who has experience with cleaning equipment. You can seek the professional advice of an equipment specialist at a reputable supply company as well. These specialists deal with equipment day-in and day-out. They have experience with many brands, makes, and models. Supply companies handle warranty issues and usually deal with repairs as well. They can offer tips based on experience which can help direct your purchase choices. Like changing the oil in your vehicle or replacing the filter in your HVAC system, regular maintenance will prolong the life of your cleaning equipment saving you costly future repairs and replacement. Scheduled PM (preventative maintenance) service with a qualified repair facility can help. There is also plenty of maintenance you can do on your own. One of the most overlooked and easiest maintenance tips is to clean your equipment after each use. Simply wiping vacuum housings can prevent dust from entering filters, electrical components, and motor assemblies. Draining and flushing the recovery tank in an automatic scrubber or carpet extractor will prevent build-up and bacteria growth that cause odors the next time you use the equipment. Next, always rinse and clean the squeegee blades and vacuum shoe after each use. Dirt and dried floor finish always collect in these areas which can very quickly cause problems with the ability of the machine to leave a clean and dry floor. Solution tanks should be emptied as well. Leaving solution in the tank can gum up filters, solenoid valves, spray jets, and solution lines all of which will affect performance. When finished using a piece of equipment, proper storage is important. Always empty both the recovery and solution tank when storing an automatic scrubber or carpet cleaner to avoid the maintenance issues mentioned above. Automatic scrubbers with lead-acid (wet) batteries should be stored in well-ventilated areas as they emit Hydrogen gas which can create a safety concern. Never store a floor polisher, scrubber, or burnisher with the pad driver or brush attached or in the down position. This can warp the pad driver or brush causing uneven wear and performance issues. Be cautious of humid and wet areas. Moist environments can corrode critical components, external and internal, causing future problems. Replace the paper debris bag in a vacuum when storing for more than a day even if the bag isn’t full. Bacteria and mold can grow on the inside and outside of the bag causing odors which can attract pests and insects. Moving equipment from job-site to job-site can wreak havoc on wheels, casters, squeegee assemblies, wiring, and brush assemblies. Ideally, leaving cleaning equipment on location is best. If this is not a feasible option, be sure to safely transport cleaning equipment using a ramp. Be sure the ramp is the correct length and width for the vehicle (preferably a cargo van) and can accommodate the weight of the equipment. A box truck with a lift gate for large equipment like an automatic scrubber or propane burnisher that cannot be stored on-site is a safe and ergonomic option. Cleaning equipment makes you money. Choosing the right equipment for the job, maintaining that equipment to run at peak performance, storing the equipment properly when you are finished, and correctly transporting the equipment when necessary will save you costly future repairs and replacement.